Gorgeous Muslim wedding with distinct décor details that are sure to light up the something in you! Each ceremony had a set theme and décor that went perfectly with it. From colorful drapes to little birdcages and beautifully printed cabanas. 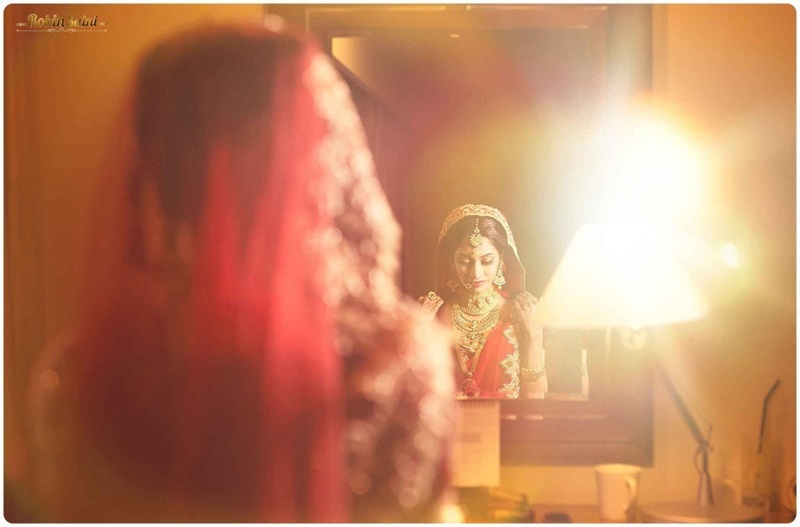 And the aesthetic awesomeness didn’t stop just there – each outfit worn by the stunning bride, Noor, matched the theme of every function too – From the haldi to the Walima, this wedding had beauty with a certain magnificence in all its elements. Drapes in hues of yellow, pink and green with tables holding jute basket centerpieces filled with green chilies and organic Haldi? How quirky, different and desi is this table setting! Each set of baskets were bordered with orange marigold flowers to add an extra touch of pop to the table setting. The exceptional factor was strong with this one! With jute chair tie-backs and the seating area’s fuchsia backdrop adorned with gold peacock feather motifs. Every component of pretty was used in making this Mehndi an elegant affair. Birdcages, fresh white carnations, chandeliers and the prettiest printed cabana we’ve ever seen. Set in the middle of a blue pool with beautiful floral floating bouquets, Noor sat under a chandelier strung cabana that added a beautiful glow to the setting. Although the pretty white birdcages filled with fresh pink and white carnations were our favorite, we couldn’t help but swoon over her stunning diamond jewellery. The nikah was an intimate homely affair with only close friends and family who witnessed the union of these two beautiful souls – Noor and Imran. The beauty and décor just leveled up with each passing ceremony at this wedding celebration. The cast iron lamps were highlight of this gorgeous walima – strung beautifully at the entrance with purple hued drapes as well as on the reception stage, the lamps added a vibe of old-school elegance to this bright and beautiful wedding. Major props to ace photographer Robin Saini who captured Noor and Imran marriage in all its awesomeness, whether it was the décor shots, the sweet candid moments or the intimate Nikah at home. But his post-wedding shoot with the couple took us by storm – each picture was full of elegance and understated grace, reminding us of old Mughal royalty.